As the principal federal partner responsible for administering the Endangered Species Act (ESA), we take the lead in recovering and conserving our Nation's imperiled species by fostering partnerships, employing scientific excellence, and developing a workforce of conservation leaders. Private landowners, large and small, play a vital role conserving habitat for fish, wildlife, and plants. Why Take Your Students Outside? Public Affairs provides information and assistance to Congressional offices, federal and state agencies, media outlets, and the general public about Service events and activities. 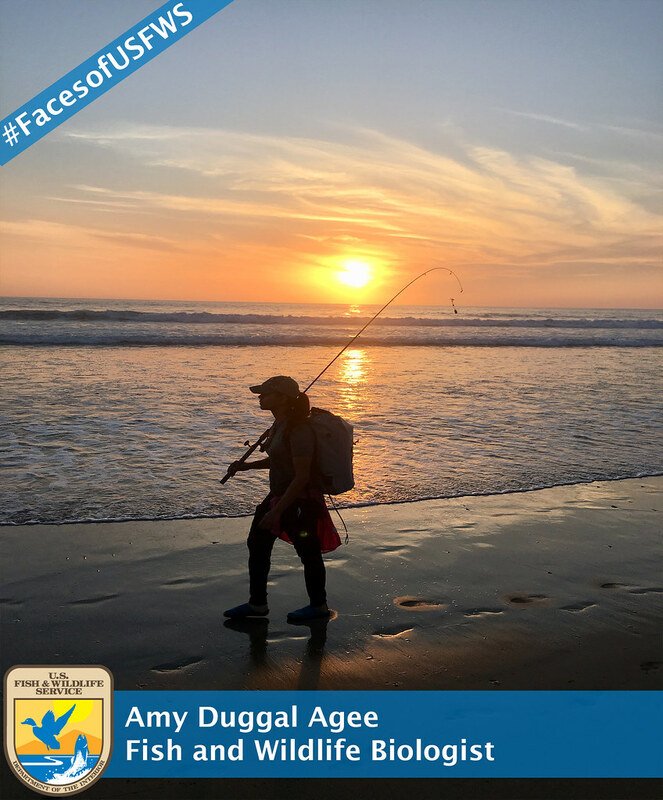 Q&A with Amy Duggal Agee, fish and wildlife biologist in Ventura, Calif.
Meet one of our newest biologists, Amy Duggal Agee. She recently graduated from CSU Channel Islands with a B.S. in biology. She served six years as a U.S. Navy Seabee building naval bases, supporting disasters and humanitarian relief. What led you to a career with the U.S. Fish and Wildlife Service? My trip to Costa Rica led by my ecology professors, Dr. Allison Alvarado and Dr. Donald A. Rodriguez, was a turning point. It was the first time I was exposed to such a staggering amount of biodiversity and unspoiled natural wonders. Two very specific ecology-based classes led by Dr. Allison Alvarado and Dr. Geoffrey Dilly opened my eyes to the application of theoretical knowledge. My professors and mentors instilled in me a conviction that we owe it to ourselves to protect the biodiversity around us now, and for the future generations. Every single species has an ecological and aesthetic value in the ecosystem, whether we understand it yet or not. What role do you play within the agency? I work with other federal agencies to protect threatened and endangered species by preventing detrimental impacts to them and their habitat. Where did you go to school and what did you study, and/or for which military branch did you serve and in what capacity? I attended California State University, Channel Islands, where I majored in biology and minored in chemistry. I served in the United States Navy Seabees for six years. Seabees build forward naval bases in war zones as well as projects to support disaster and humanitarian relief. Of all the species our agency works to protect along the central California coast, which is your favorite? Why? I currently work to protect the San Joaquin kit fox, a species that has suffered immensely from habitat loss among many other issues. I work to protect this animal's habitat and help move the species towards recovery. Tell us about a particular project from your career or schooling that makes you really proud. I feel fortunate to be affiliated with this agency while still keeping in touch with my military roots. I am proud of the work I get to do with the military, especially at Fort Hunter Liggett and Camp Roberts. I spent time at those bases for field exercises during my military service, and now I have the opportunity to see the area from a very different perspective, in terms of the wildlife these bases host. I absolutely love camping and hiking with friends and family. I also make every effort to participate in volunteer activities as a way to increase my knowledge of our native and non-native species. I enjoy leather crafts when I have the time. I make hand carved and tooled bags, knife sheaths and handgun holsters. Historically, mankind has used leather for not only clothing and shelter but also as currency and parchment to record thoughts and knowledge. It’s a hobby and trade since the Middle Ages and anyone can learn this fun art. All you need are a few tools and an imagination!